Allison Mitchell's winning handbags come in all shapes, sizes, and skins. What skins are in this season? I did a strong, sophisticated collection for fall that was centered around rich, edgy textures. You’ll find crocodile backstrap, the natural “head to tail” of the croc; bubble lamb leather; Mongolian lambswool; sharp python; and pirarucu. What the heck is a pirarucu? It is an Amazonian river fish also known as the arapaima gigas. It’s a humongous monster of a fish, and the tannery I buy my skins from is one of only four tanneries certified to legally produce pirarucu leather. It’s an extremely regulated process, as the pirarucu used to be an endangered species. Now the fish are processed not just for their skins but for their meat as well, which is sold to grocery stores and restaurants around Brazil. My tannery also tells me that they rely on the local fishing villages to supply their demand, which brings jobs and commerce to the ancient communities along the Amazon. A number of your bags are lined with vintage kimonos. Where did the Japanese inspiration come from? Pirarucu doesn’t come cheap. 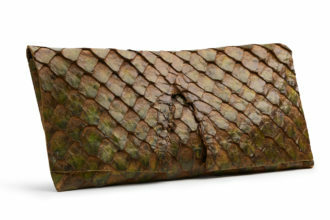 Clutches range from $1,250 for a small evening bag to $2,875 for thigh-size (above). Oh, this is my favorite story! I had this idea of lining the pirarucu collection with kimono-like silk, but I never found anything detailed or rich enough. One day, I was checking our Instagram and saw that a new account began following us called Elle Rose East. The description read “wholesale kimonos, Nagoya, Japan,” and of course I went nuts, because I had stumbled upon this incredible source. I did a little more research to find out who to contact, and I saw that she was not only a fellow Hockaday alumna, but a girl who had been one of my best friends from pre-school to fourth grade, when she left Hockaday. We had lost touch, and I had no idea she was living in Japan. It was bashert! What’s the ideal size for a clutch? The size of your thigh. Hah! I believe that size dictates occasion. The bigger the clutch, the more casual the outfit; the tinier and more precious, the daintier and more darling. I am a casual dresser, so I need a big statement clutch way more than I need a small evening clutch. Why did you decide to make Dallas your base? Honestly, Dallas sort of chose me. I had no intention of getting started in this business, but when the women, buyers, and fashion community of Dallas showed me such incredible support, I couldn’t say no. Dallas will always be the most important city for my business. Plus, Dallas women love big ol’ handbags. An Allison Mitchell fuchsia calf hair travel pouch containing business cards, oil blotting pads, Aquaphor, my iPhone, and my Illesteva “Leonard Mask” sunglasses in chrome (I’m obsessed with them). When you switch bags as often as I do, you eliminate clutter.